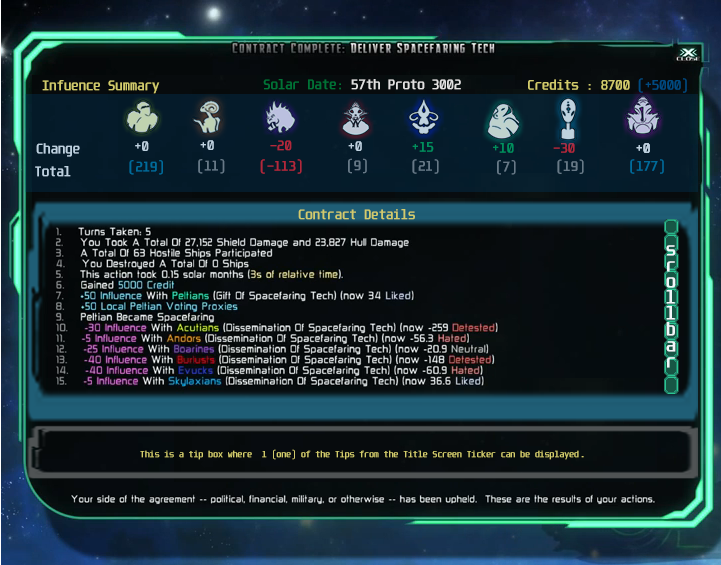 I feel like the Contract Complete Screen can be improved aesthetically. I'm sure if implemented, X4000 and team will improve and pretty up this design. If mouse on Race Portrait, it gives the bio of the race in a Tooltip. If mouse on Change: +0, -20, - 15 etc...it tells you that negative influence is bad, positive is good in a Tooltip. If mouse on Total: (219), (11), (-113) etc.. it tells you all of the diplomacy ranges like Detested, Venerated from most positive to negative. If mouse on Solar Date: Tells you a Tooltip of the different seasons and that there is 20 solar months in a year. If mouse on Credit, tooltip about Credit. If mouse on Influence Summary, tooltip about Influence. If mouse on Tips, tooltip that Arcen Forums are open for strategy and help . Great mockup! I really like the part at the top, but would probably adjust it to also display the name of each species above (or below) the portrait for new players. The credits are a nice touch, but may want to switch it to +5000  to keep it consistent with the race changes. I would consider dropping the solar date as I don't think that's particularly needed on the screen (but it does look nice). There's also the tricky aspect of displaying when the relationship between two species changes as a result (e.g. gifting technology via another race), but that's pretty rare and can probably be relegated to text. Nice work! Basically I did this mock up because I think there should be a "at a glance section" if you just want to see what is really important, and don't want to read a bunch of text.